Oil rich Saudi is not the only country getting slack for greenhouse gas emissions. 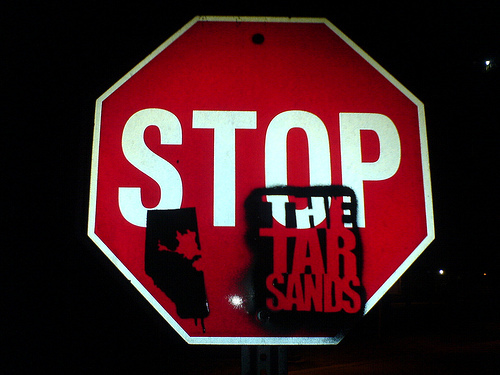 This Canadian writer points the finger at Canada, where tar sands are yet to be an issue at climate change talks. “You can’t go for a walk in the forest without having an impact, because you left a footprint. That doesn’t mean you shouldn’t go for a walk in the forest,” Brian Ferguson, CEO, Cenovus Energy Inc., a company that owns interests in the Alberta tar sands development. In these pre-Copenhagen days, Canada has become a bit of a whipping boy over its environmental record, especially regarding the Alberta tar sands, that vast (149,000 square kilometers) bleak area where forests have been clear-cut and the earth dug up to get at the black, oil-rich dirt. How indeed? Canada a greater threat to the world than Iran? barrels of oil reserves (counting the tar sands), Canada is second only to Saudi Arabia in the amount of oil it holds. This is what he means when he says that Canada is destined to be an “energy superpower.” And despite falling oil prices due to reduced demand since 2008, and a rash of suspended or canceled oil recovery projects, the potential is there for hundreds of billions of dollars in oil revenue and millions of man-hours of employment. This will depend to a degree on rising prices for oil—it is vastly more costly to extract a barrel of oil from tar sands than to pump it out of the ground—but no government could turn its back on that kind of potential wealth. Part of that story will undoubtedly be Carbon Capture and Storage. The prime minister will certainly play the CCS card at Copenhagen to show that Canada is a “leading” player in the fight to clean up the environment, and he will point to the just-announced Alberta Carbon Trunk Line, the world’s largest carbon capture and storage pipeline, in Alberta. carbon capture projects, with new oil companies connecting to the network as needed. This latest announcement comes a month or so after the two governments announced a carbon capture system to be developed with Royal Dutch Shell and a similar system at a coal-fired plant owned by TransAlta Corp. A fourth project is to be announced December 2, worth another $200 million. All together, the carbon capture projects represent about $2 billion in funding, proving, according to the government of Canada, that they are serious about this. Natural Resources Minister Lisa Raitt declared that CCS technology was Canada’s “best chance to capture emissions.” It remains to be seen whether the systems will work. They have not been tested and the technology is new. More importantly, there’s no guarantee the projects will actually go ahead. Even if they do, none will be operational until 2015 at the earliest. They will have no impact for at least five more years on Canada’s steadily rising emissions. Tailing ponds: are they safe? While the tar sands are seen as a major contributor to the problem of global climate change, what is not as likely to come up in Copenhagen is the effects of the exploitation of the tar sands on the environment and people in the immediate vicinity. The most visible element of this local issue is the tailing ponds created to hold the massive amounts of spent water needed for the process of extracting oil from the sands. As of June, 2008, according to a report entitled Watered Down: Overcoming Federal Inaction on the Impact of Oil Sands Development to Water Resources, 720 million cubic metres of toxic water sat in these tailing ponds, covering an area of 130 square kilometers. If these ponds are breached, or their toxic water seeps into ground and surface water, the results could be catastrophic for humans and wildlife. There have already been wildlife kills, most prominently the deaths of over one thousand migrating waterfowl that landed in a pond. Of even greater concern is the effects of all this toxic water on the First Nations people who depend on the Athabasca River from which the water is diverted in the first place. There is mounting evidence that the people of Fort Chipewyan, Alberta, are dying in unusually high numbers of rare cancers. Fish caught in the river are showing tumours and other abnormalities. A Suncor spokesman assures us that the tailing ponds were designed by experts to prevent leaking, so they must be safe. Experts can’t be wrong, can they? Meanwhile, the Alberta Energy and Resources Conservation Board (ERCB) released rules in 2009 regulating the recovery of solid materials from the tailing ponds and requiring companies to submit management plans by September 30, 2009. Directive 074 of these rules concerns the removal of fine mineral solids from the water and the disposal of these solids in specially designated areas. • Establish enforceable standards under the Canadian Environmental Protection Act for key toxic substances created by oil sands activity. Northwest Territories, Saskatchewan, and Aboriginal governments. • Establish strict, enforceable, and protective limits on water withdrawals [from the Athabasca River]. • Conduct a comprehensive peer-reviewed assessment of the health impacts of industrial oil sands development on the residents of First Nations and Métis communities. • Require the completion of a comprehensive cumulative effects assessment and establish binding limits that protect the natural environment based on that assessment. • Identify and protect the habitat of listed species at risk in the region affected by oil sands activity. • Implement the Migratory Birds Act and prosecute bird deaths on tailings ponds. • Assume the leadership responsibility for monitoring the environmental impacts of oil sands development. • Institutionalize proactive measures requiring oil sands operators to pay for the environmental damage caused to water resources. • Set and adopt absolute targets for greenhouse gas reductions. Quite a list when you consider that, according to the oil companies, there’s no problem at all. you can do than promise something you can’t, provided that you intend to make good on the promise. fuel energy than Iceland. Canada is a developed country with huge infrastructure needs and certainly no politician would dare do anything that would threaten our standard of living. Canada’s emissions have steadily risen since it signed the Kyoto accord, an accord Stephen Harper repudiated from day one, it is time for Canada to finally do something—anything—to clean the tar off its face.